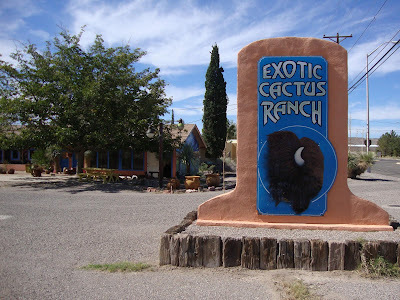 I just couldn’t get inspired to write the post I’d planned for today, so instead we’re going back to the Desert SW and a stop at Buffalo Bill’s Exotic Cactus Ranch, yeeha! I realize the sign just says ‘Exotic Cactus Ranch’ but trust me on the name, after all there is a buffalo on the sign. And isn’t the phrase “cactus ranch” just the best? I want to own a cactus ranch! That way Andrew could say things like: “nope Loree’s not in town this week, she’s out at the ranch, the cactus ranch”….ah that would be the life. I also love this little scene, just look at those fabulous old street lights… Anyway, the Cactus Ranch is located in Truth or Consequences, New Mexico, also home to my in-laws (click here if you wonder how Truth or Consequences got its name). Last time we visited T or C the nursery was closed, but we still poked around, looked at the plants outside and peeked in the greenhouse. Remembering that visit I was disappointed to see how small their selection was this time. I assumed it was the economy causing them to scale back, but I was wrong. Turns out it was the weather…a one two punch of a freak cold winter and a freak wind storm. The cold took out a lot of the large potted Agaves which sat outside, and the wind storm was so powerful plants ended up across the street. They had a very old and huge Pachypodium lamerei which was snapped in half. So sad. Still I found plenty to gawk at… These guys looked like they’d been rescued from a construction site or maybe a gardener who didn’t appreciate them, can you imagine planting these? You’d need excellent gloves. This Euphorbia trigona v. Rubry stopped me cold (hot?). If I’ve ever seen this color on this plant before (I’m used to see a dark green) then I don’t remember it. Gorgeous! They had smaller sizes too; one of those came back to Oregon with me. What a tall Kalanchoe! And babies… Euphorbia horrida 'Snowflake' Spikes! And flowers… And fur! So many wonderful things! One of these little Aloes came home with me too; I couldn’t resist the powdery blue color combined with the pink stripe along the edge. Of course now I can’t remember what it’s called! I had to leave these tall Aloes behind. Here is evidence of a past Agave bloom (A. vilmoriniana perhaps?). If I remember right they said a friend or neighbor had a plant bloom and offered them the little "plantlets" (or bulbils) that formed along the spike. The tiny white tag has 11/5 written on it, which would mean these little guys are almost one year old, we visited on 10/15. Well I guess it was fitting that I wrap up 2011 with a spiky post from the desert and pictures of baby agaves. Hope you all have a wonderful New Years Eve, be safe…and I’ll see you in 2012! What stunning variety. The buffalo baffles me. Superb selection of succulents, and love that Euphorbia, I'm not surprised you were smitten. Aloe striata there Loree; I foolishly left mine outside last winter and it turned to a pile of mush. Bad me. Loree's Cactus Ranch: I like the sound of that. Wow so cool, Frozen Canadian lacks in cactus ranches, go figure. That red E. trigona is awesome, I saw one in mexico at a craft sale but reluctantly left it behind. I have a 8 foot tall, 25 year old green one tho. Once yours gets established perhaps you'd trade me a cutting. Nice post. I bought Oreocereus from them (rotted). Those spiny ones (Echinocereus coccineus) are a piece of cake to plant...takes a round shovel. Got 10 waiting to be transplanted. You conjured up a great mental image for me of you with chaps and a pair of thick cow-hide gloves, wrangling the spiky herds on your ranch! Some great plants there: I like the Euphorbia, that little blue agave with the pink stripe you fell for, and those "rescued" cactus bunches. Happy New Year! I hope it brings you lots of baby agaves to love! Great post! I'm so glad you don't stop at 3 photos, but give us a wonderful view and feel for a place. That's a beautiful aloe you took home. Hanging out at your cactus ranch sounds very cool. I guess that a Scottish equivalent would be "hanging out at the heather ranch". Hmmm, doesn't quite have the same ring to it!!! Thank you for publishing your excellent blog and I look forward to seeing many more stories and photos of danger plants throughout 2012. Patricia, I think that the Buffalo part might have had something to do with previous owners. Or maybe I'm just making that up. Mark and Gaz, naturally I really wanted to take home one of those large Euphorbia, instant impact! ks, ah yes that's it thank you! And warning noted. Gerhard, what would your ranch be called? Hoover, me too, and happy new year to you. Nat, when established a cutting is yours. DD, and happy ranching to you too! Will all 10 be planted at your ranch? MulchMaid, I don't know about the chaps but a nice big straw cowgirl hat for sure! David, I'm excited to see it grow (the aloe)...hopefully this summer will be sunny and warm enough to give it a big push. Adam D, thank you, and I'm glad you became a regular visitor in 2011 and I hope to hear from you in 2012...you'd be welcome at the cactus ranch anytime! You must have been in 7th heaven. I wish you a cactus ranch this 2012. When you dream, dream big, right? Do you know the name of those baby agaves? I have 3 and I'm combing the internet for their name!! My guess at the time was Agave vilmoriniana and I don't have any better guess now. do you know the name of the green agaves? There were succulent stamps in my stocking! But where do you garden?